Time flies and another month just finished, time to see how it went! We are happy to read the feedback we are receiving on the work of our Support team, we believe it’s important to be as transparent as possible, and it’s good to see people appreciate it. October gave us great satisfaction and a little regret: we got close to 99% satisfaction rate, a great result for us. Even in this month, more than 300 customers have rewarded our support service, thank you! Once more, let’s go through the two most important elements to evaluate our service: the satisfaction rate and the first answer time, then I’m going to focus on an equally important element: the number of tickets. Repeating a 98% satisfaction rate is a great result. The first answer time decreased again from September, going from 17.6 to 16.2. Considering we invested new resources in our Support service in January, when our average answer time was 29 hours, this sounds like an amazing result. We went from almost 1800 tickets in January to 1500 in October, an extraordinary result in more than one way. A lesser number of tickets allows us to offer a better customer service, as we can offer them more time and attention. And this can only be obtained by offering full products without any issue, exhaustive documentation pages, a richer Help Center filled with FAQ and by solving problems at their roots through constant updates and upgrades for each plugin. 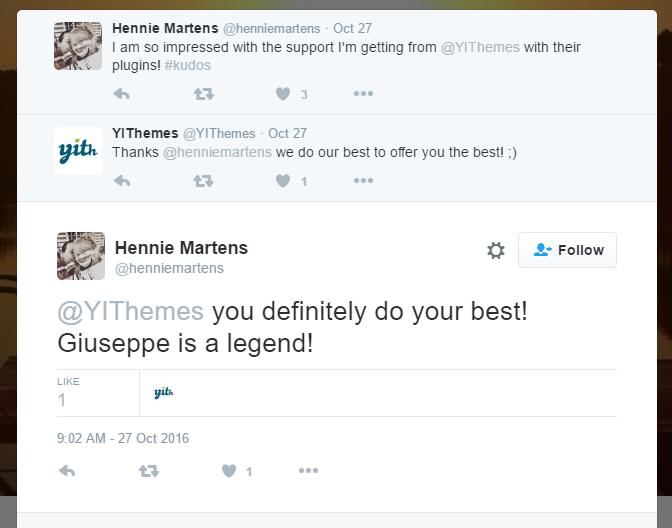 Which is why a special Thank You goes to Giuseppe, which manages our support team and to all of our developers who allowed us to achieve this result. And here are the rest of the comments you sent us… you are amazing! Wyman Kingsley: Awesome!!! Giuseppe, Thank you so very much, the plugin update works an absolute treat. Big thank you also to all the team there at YITH, I am sure when others discover this function the product add-on update they will as I am be very grateful :) All the very best. Dimis: Support was very polite, quick and gave effective answers and solutions! Stuart: absolutely perfect service, would recommend this company whole heartedly. Jennifer: Fantastic support. Very happy customer. Thank you! 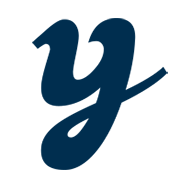 Tia: YIThemes is the best! Best investment I've made in my design career. Fabfel: Customer service is very efficient and fast, with clear, detailed answers. Patricia: Excellent support, very fast response and very competent answers. Best support team ever! Ronald: Great support in a personal way, just the way it should be! So please, feel free to write us suggestions, improvements or any other thing you think might help us, by using the comments on this article or using our contact form or our live chat. It’s always a pleasure to hear from our customers!